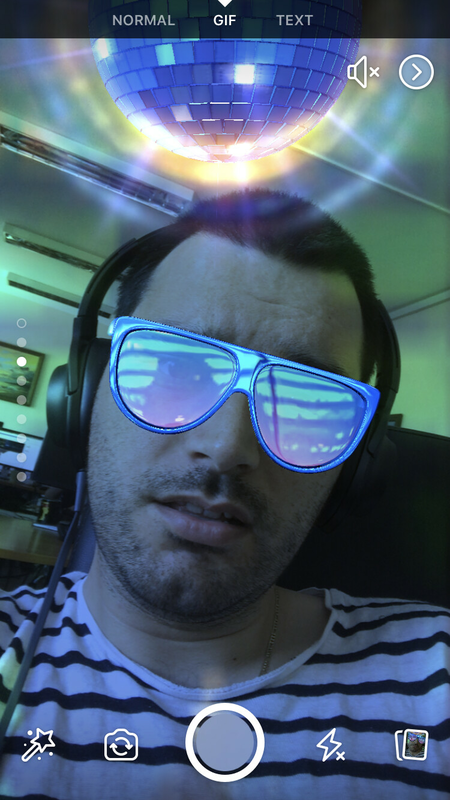 When was the last time you felt like capturing an augmented reality GIF of yourself, all part and parcel with an animated disco ball and wacky rainbow-colored sunglasses? How about an RGB split, surely you can never have enough of those aesthetic RGB splits! You might as well just fire up the Facebook app on your phone right about now and do just that as Zuckerberg's totally-not-creepy social network now lets you create GIFs (with a hard "G") and share them with your buddies. You can't just shoot and save these to your device, however, so it's either just goofing around with the 20+ Snapchatesque filters and AR lenses or nothing at all. That's unlike Snapchat, which lets you save your goofy Dancing Hot Dog memes and share around on whatever platform you feel like. Facebook's GIF feature should be available to you already - to access it, simply swipe right on the home screen to access the built-in camera. Then, take a look at the top portion of the app, where you will see Normal, GIF, and Text modes. Go for GIF and express yourself. In case you're not seeing the GIF option in the camera app, either patiently wait for it to hit your device or... don't – we were better off without it either way. This almost tempts me to install Facebook, than I remember I wiped out my friend list and quit using the service for a reason. welcome to the dark side, buddy.